Hello hello! Today I'd like to tell you all about this book that I've been obsessed with for the past few months: Green Kitchen Smoothies. This book comes from David Frenkiel and Luise Vindahl, the Scandinavian super couple behind the Green Kitchen Stories blog. Their blog focuses on healthy vegetarian recipes, but this book is even more specialised - all smoothies. 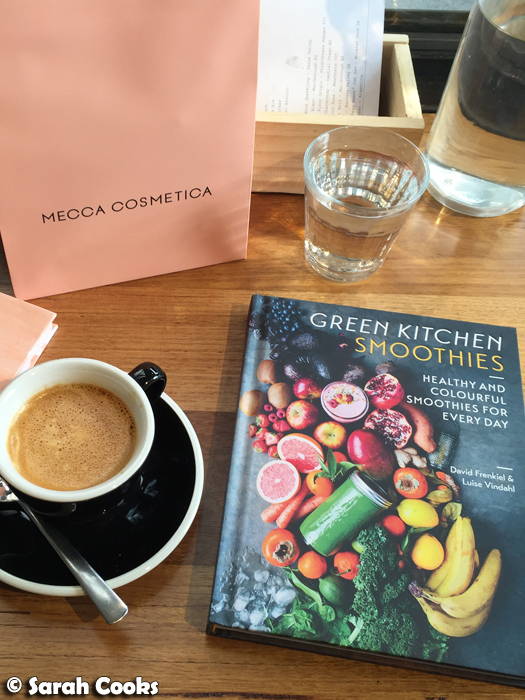 Prior to Green Kitchen Smoothies, I hadn't actually heard of these guys - I saw a feature on the book in Delicious magazine mid-last year, made the fabulous Chia & Raspberry Pudding and the Kiwi, Kale & Chia Parfait, and realised that I needed this book in my life! I quickly purchased a copy, and have been enthusiastically cooking (or blending?) from it ever since. Y'all know I love instagramming my breakfasts (avocado toast, açai bowls, and overnight oats are favourites), but last year I felt I was in a bit of a breakfast rut. 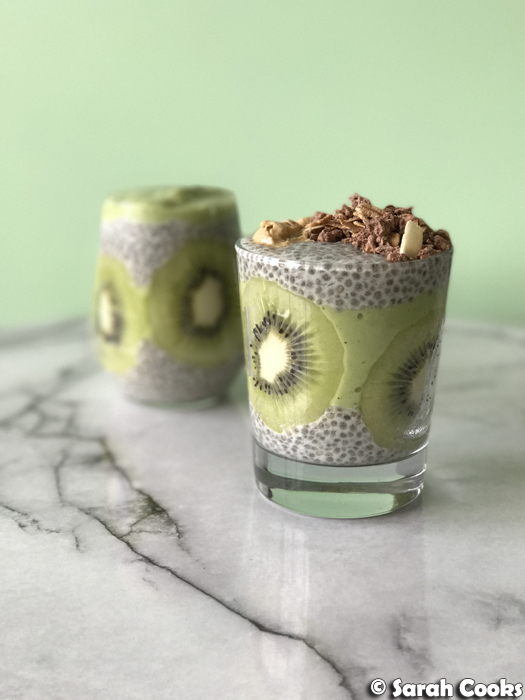 Well, the recipes in Green Kitchen Smoothies have not only helped me get out of my rut, but have also lifted my breakfast game significantly, with all their great recipes and pretty presentation ideas. I would have thought that a smoothie-only book might be boring or repetitive, but that is certainly not the case with Green Kitchen Smoothies - the recipes are all really varied and unique in terms of flavours, ingredients and presentation. There are some general tips and tricks for creating great smoothies, basic recipes (nut butters, nut milks, granola etc), as well as simple smoothies juices, and desserts. However, I've personally found their "Showstopper" chapter to be the most useful - easy smoothies with simple ingredients, presented in a really eye-catching way. Let's look at some more of what I've made! 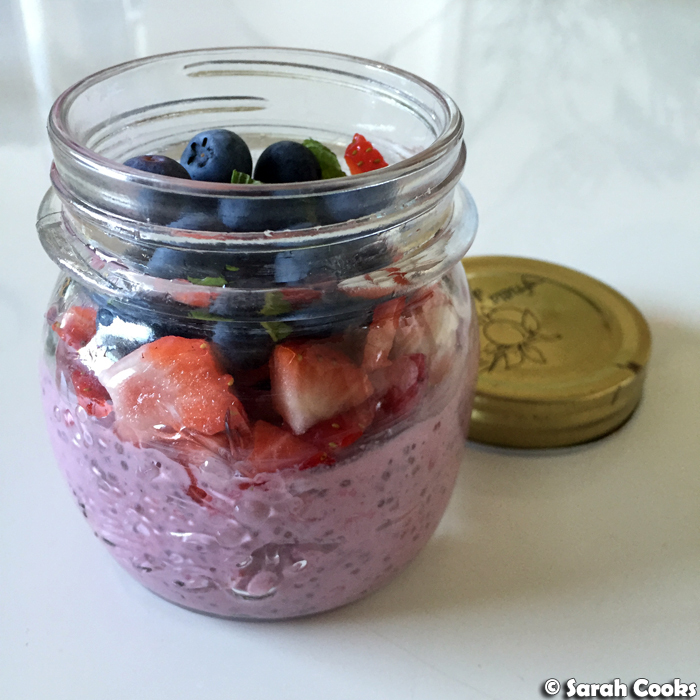 The kiwi parfait and chia and raspberry pudding that you see above are both favourites, but my most often made recipe is the Grab-and-Go Blackberry Oats. 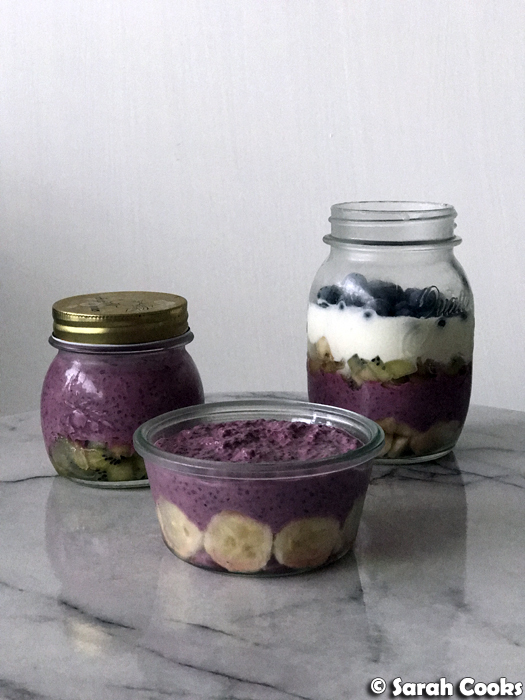 This is basically a fancy spin on overnight oats, with the oats and chia being soaked in a mixture of yogurt, frozen blackberries and honey. So tasty and nourishing! 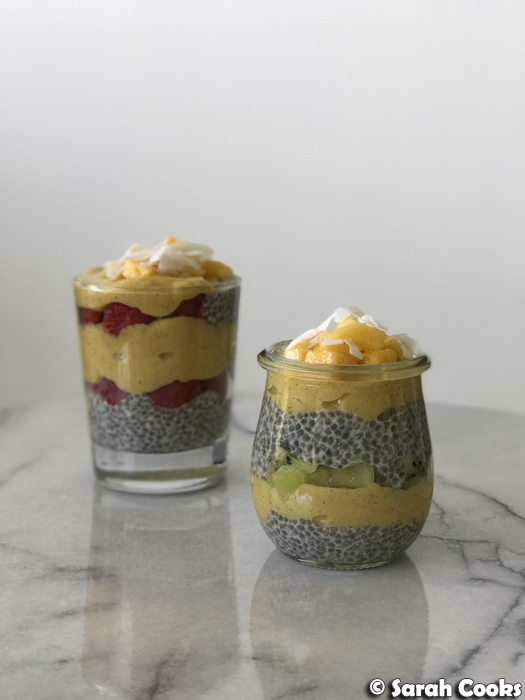 The Mango and Chia Parfait is similar to the Kiwi, Kale and Chia Parfait, in that it's a fruit smoothie layered with chia pudding in a glass. Pretty! 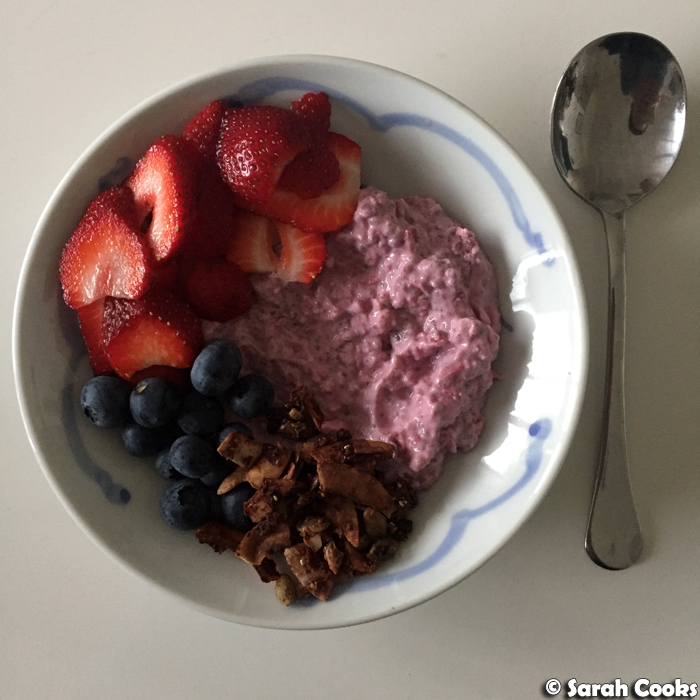 I made a version of the Pink Breakfast Bowl for dinner one night when I was craving something cold and refreshing. No harm that it matched my pink flowers too! 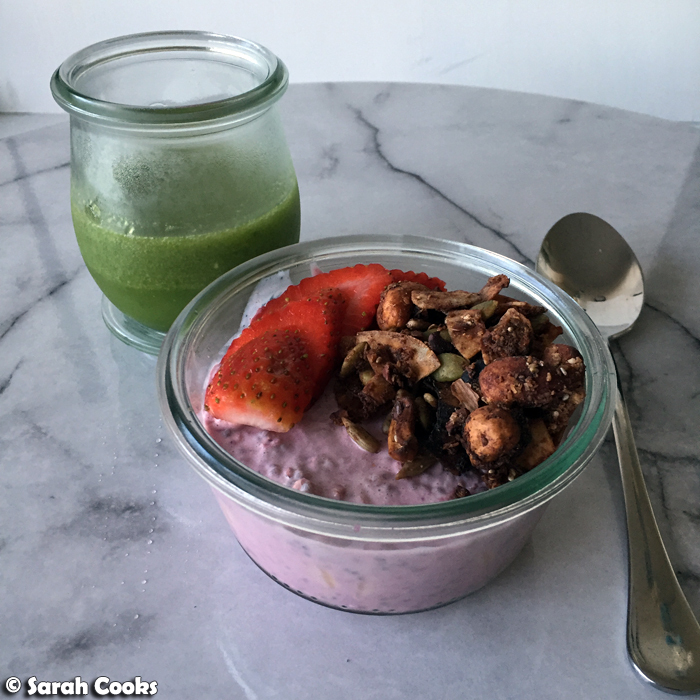 (Note to self: I made this without the maca powder, and added some Greek yogurt to give it a tangy fro-yo vibe). 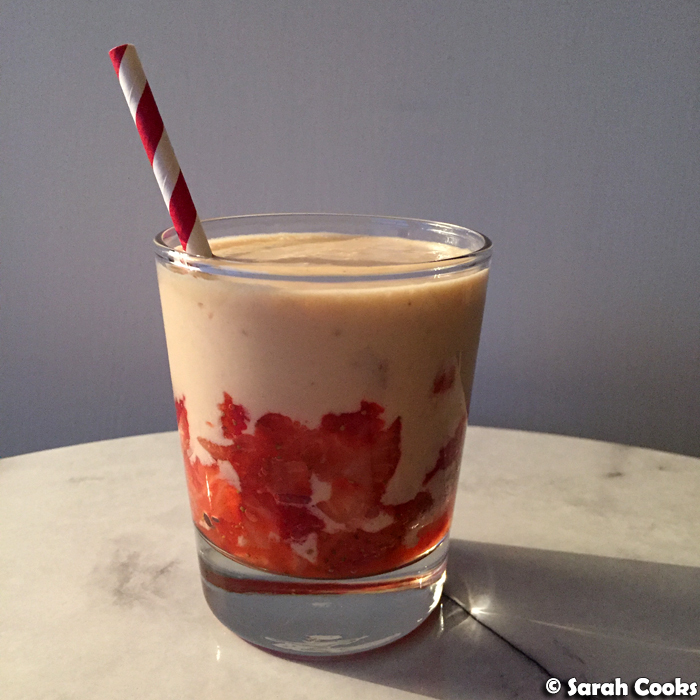 The Peanut Butter & Jam Milkshake is really simple (just peanut butter, milk, frozen banana, strawberries and lime juice), but looks so pretty and tastes amazing! 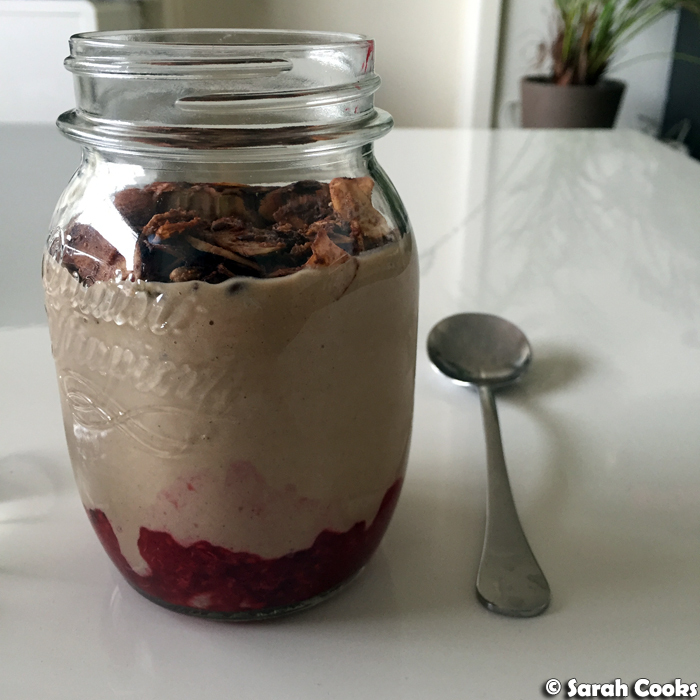 It's quite rich though, so I tend to make this in small quantities and enjoy it as a pre-gym pick-me-up. This one is called Nuts and Blues, but perhaps I should call it Nuts and Reds, as I used raspberries instead of blueberries. Either way, still good! 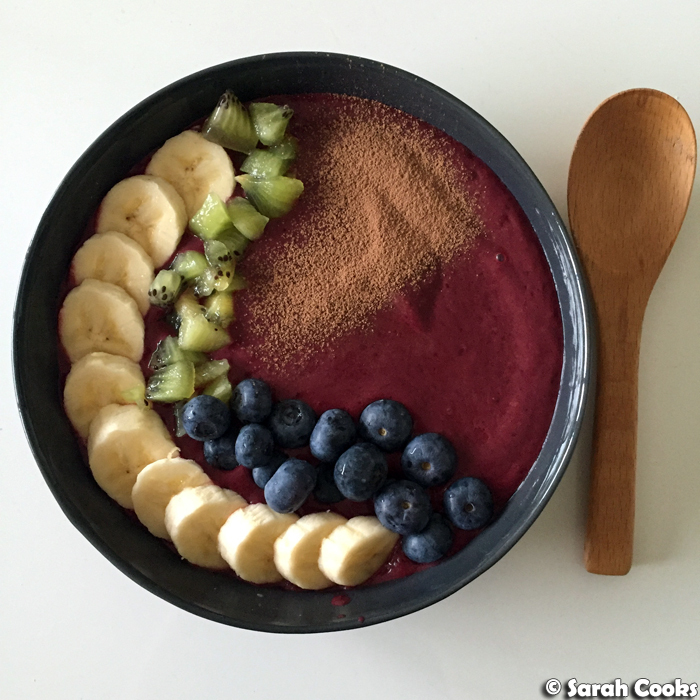 The smoothie itself is a rich mixture of banana, avocado, nut butter, cacao, milk and salt. This next smoothie is a Mocha Morning Buzz, a tasty mixture of dates, cacao, oats, milk, espresso, and coconut oil. 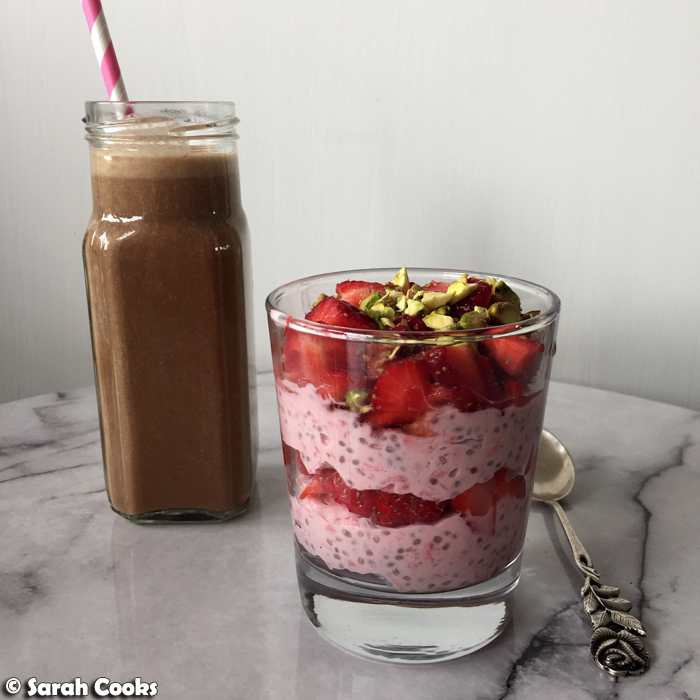 The strawberry chia parfait you see is not actually a recipe from the book, but something I made up, layering it up Green-Kitchen-Smoothies style. I made the Chocolate Velvet out of curiosity, but it turned out to be so delicious! 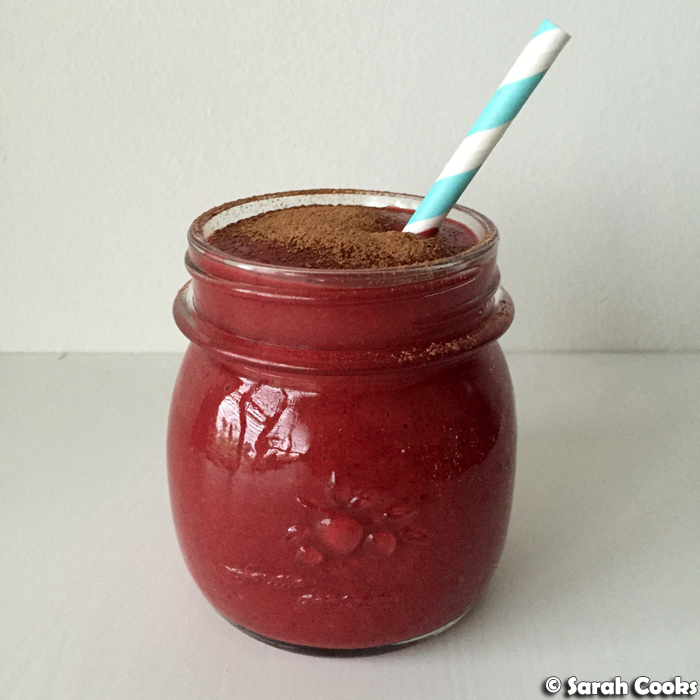 This smoothie is based on cacao and raw beetroot, and has a wonderful earthy taste, not to mention a gorgeous colour. It's reasonably thick, so I found that it made a great smoothie bowl. 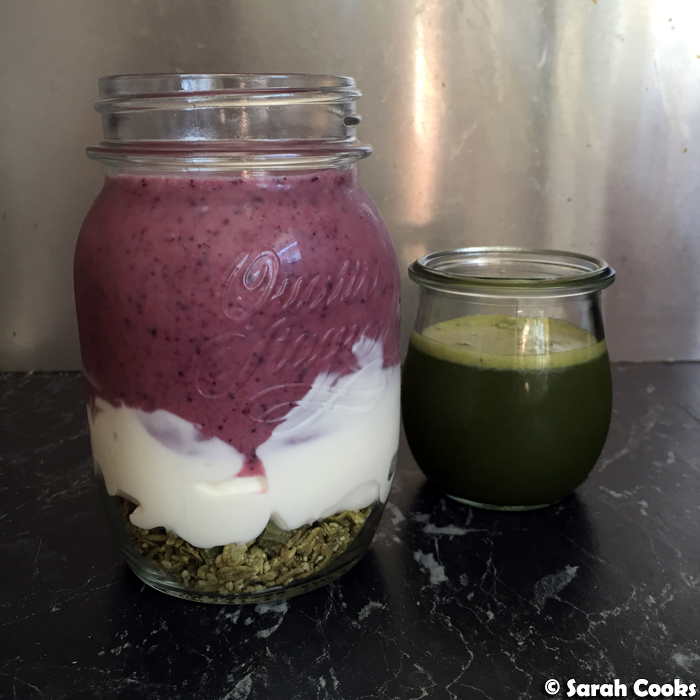 The Upside-Down Breakfast is another simple smoothie presented in a cute way. 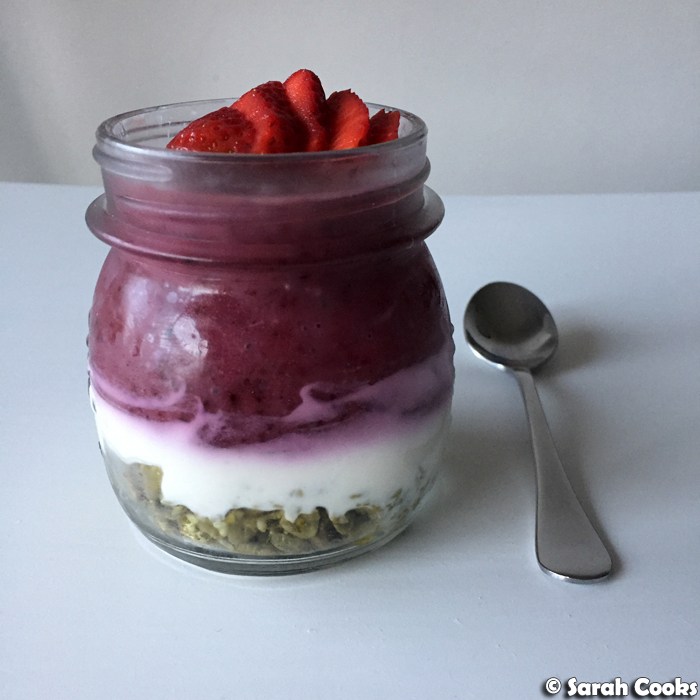 In this case, it's a berry and spinach smoothie layered with yogurt and granola. (I used my matcha granola). 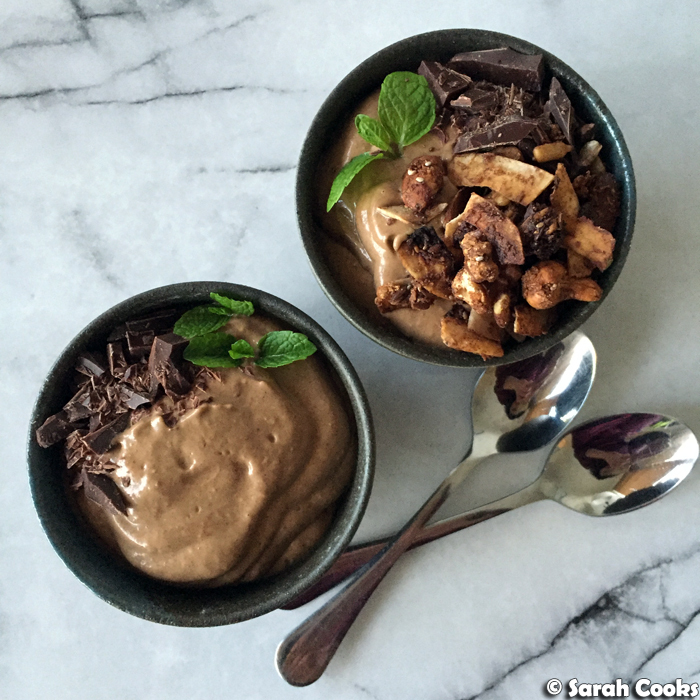 I've made one recipe from the dessert chapter so far, the Triple Chocolate Mint Bowl. This is an avocado-based chocolate mousse. I made it one afternoon when I had some ripe avocados to use up, and was really impressed. It's rich and creamy and tastes very decadent - I've made it a couple of times since when I'm craving a dark chocolatey treat. And that's what I've made so far from Green Kitchen Smoothies! 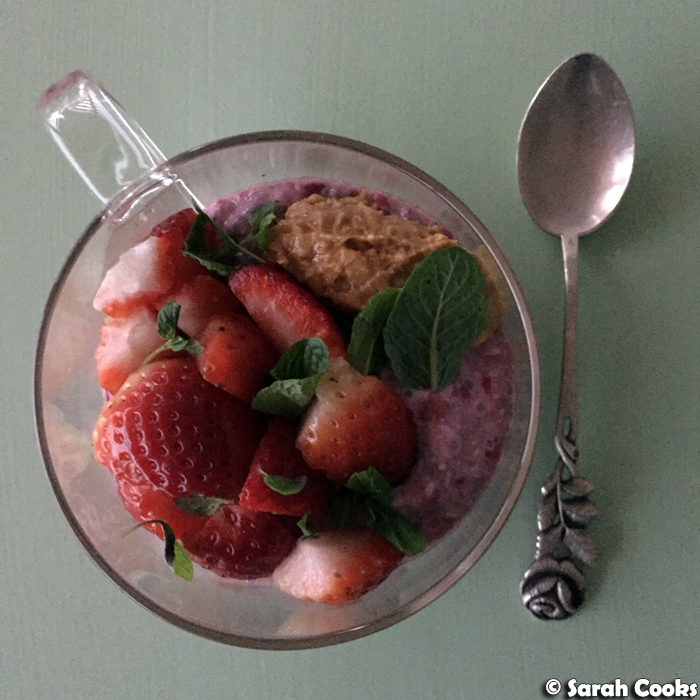 It's been such fun making pretty breakfasts and expanding my breakfast repertoire. There are heaps of other great recipes in there which are on my list to make too! 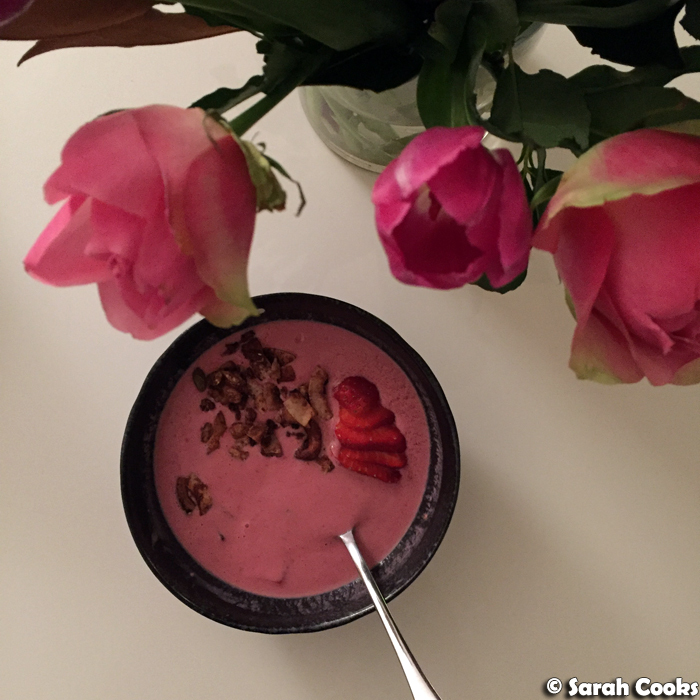 Do you have a favourite smoothie recipe? Or a cute way of presenting your breakfasts? Hit me up in the comments!